Tell the unique story of your romance, from the very first day you met and give your loved one a truly original gift that’s all about the two of you. Picking a gift out for your partner can be uninspiring sometimes as it feels like everything has been done before. We know all you want to do is let them know how special they are so that’s why we decided to create something really different with this one, something personal that celebrates your romance. 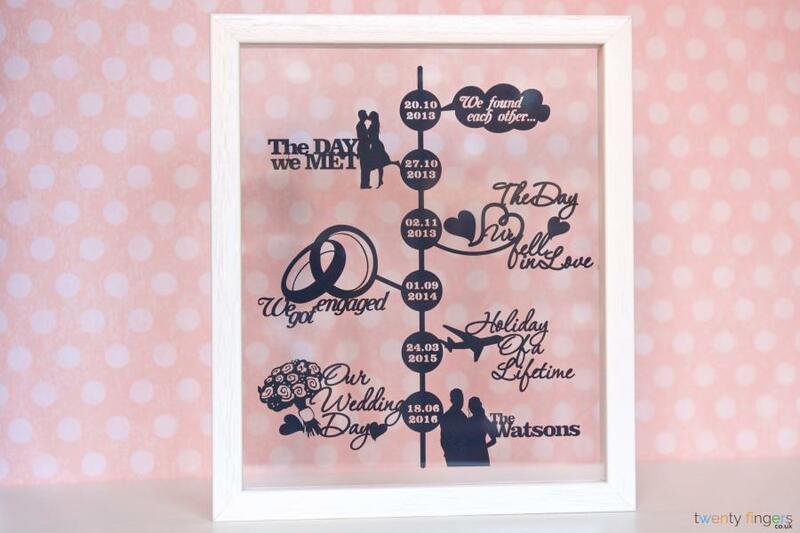 We put our heads together and came up with this bespoke beauty to solve all your romantic pressie giving problems – our perfectly personalised Story Of Us Timeline papercut. 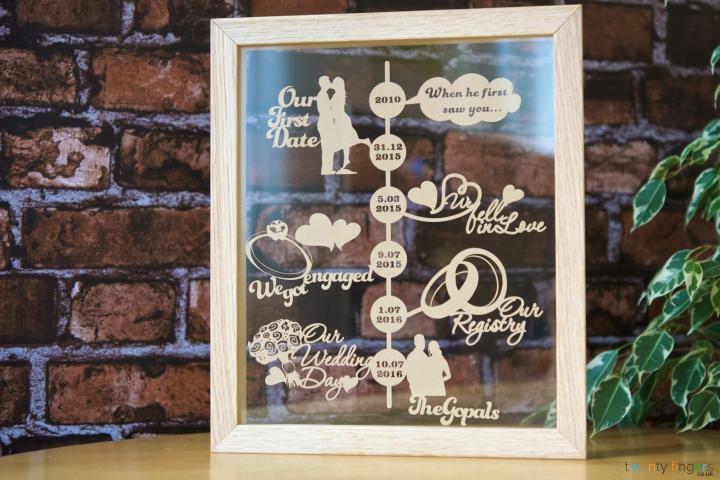 This one’s extra special, truly bespoke, no two of these are going to be alike, this gorgeous papercut can be customised almost any way you want, with artwork and important events that mean something to the both of you. 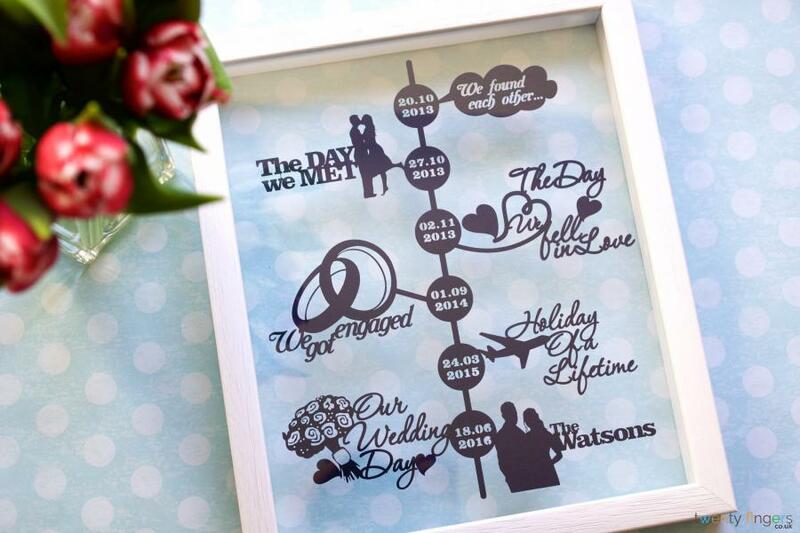 Perfect for Valentine’s Day, a wedding anniversary, birthday or just because, gift them our beautiful Story Of Us Timeline and let them know how much you cherish your relationship. Choose the size of your artwork. Choose the frame (unless you want it unframed and will frame it yourself). 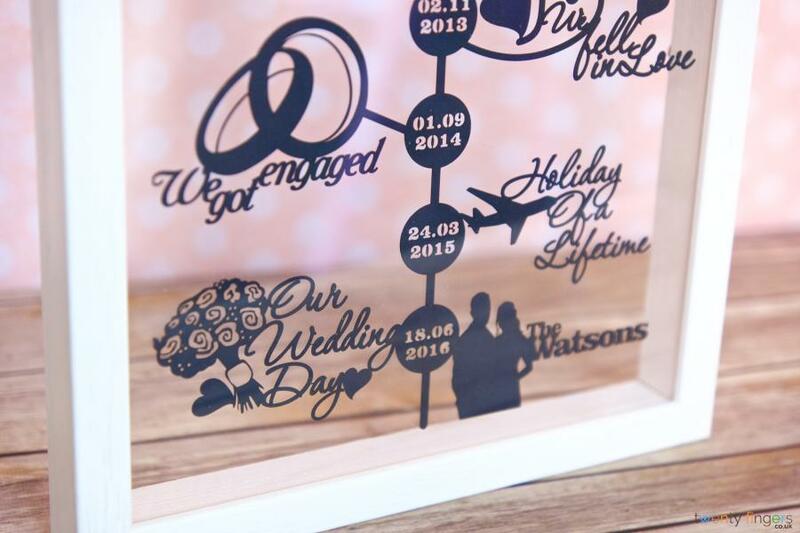 Let us know all the important events you want included in the boxes provided, include the date and the text you want on your papercut. Make sure to check the spelling as we want to get everything right for you. If you would like any particular embellishments to accompany each event ie: cradle for a new baby, balloons for a wedding etc… let us know that in the embellishment box and we’ll do our best to incorporate them into your piece. If you leave it blank, we’ll choose ones we feel are appropriate. Framed using one of our unique, handmade floating frames designed by us and made by our local framers in Buckinghamshire. The frame inner measure 10” by 12”. Framed using one of our traditional style frames using the background colour of your choice to complement your unique piece. This option is also £10 less comparing to the floating frames. Invisible TrueColour Glass eliminates 99% of sun glare and adds UV protection to your artwork. It does cost a bit more but is well worth it as.